First off I have to say that I think I may have found the most impressive computer bag that I have ever used and that the bag, although it looks small on the outside, holds all of the stuff detailed below along with having a pocket big enough for a 15" MacBook Pro, which, those of you that have MacBook Pros, know is no small feat. In most cases I would go and link to a picture on the manufacturer's site instead of taking a picture of the bag myself, but I guess the bag is so new that the manufacturer doesn't have any pictures of it yet, so I am including my own pictures below. 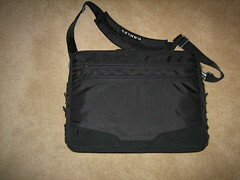 The amazing thing about the Oakley bag is that it looks so slim when it's completely loaded up -- everything except the MacBook Pro is in the bag in the pictures and it's hard to tell that there's that much stuff in it. 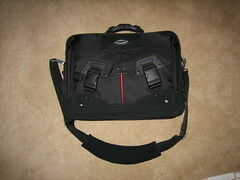 Oakley's Computer Bag 2.0 has a suggested retail of $150.00 and is available for sure at the Oakley Store in Cherry Creek Mall in Denver. Trackback to this link and tell me what's in your bag.